JOE BUN KEO: Portraiture of the self can express vanity, portraiture of others can express admiration, and some portraiture can memorialize and immortalize. What are you aiming for in your portraiture? SHERI SCHWARTZ: At times, I seek out particular people to paint because of a social issue, or they look like someone I’ve seen before in a painting. Regardless, I am always concerned with formal painting. I go after shape, line, light, and the space around the figure. The aesthetics may convey an emotion. I paint slowly, and my portraits are subtle and get stronger when one studies them. I would like my portraits to remain representational, yet be very different from those before me. That is extremely difficult because I am competing with so many great painters, including those of the Renaissance. I feel that if my style strengthens and I stay honest with my process, then my portraits will be different. After all, everyone is unique and has a voice. If you are technically able then your message will be clear. To get one’s message across in a portrait would be great because portraiture is probably the most recognizable art form. It reaches many people, including those who may know little about art. 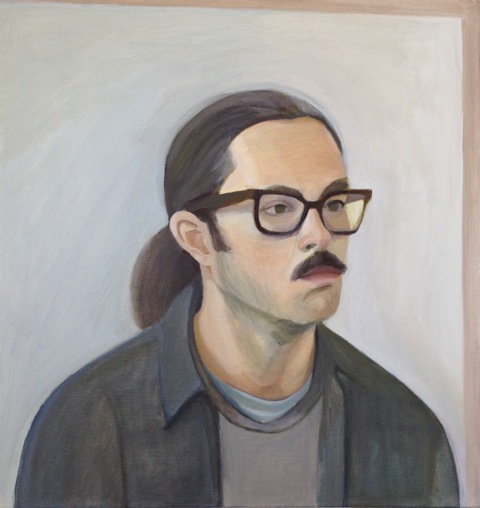 Sheri Schwartz, Portrait of a Young Man in a Chaperon, 2012, oil on canvas, 30 x 22 inches. JBK: Flemish artists were some of the first to paint portraits of people other than their donors, patrons, or religious and state commissions. They broke out and started painting individuals from the middle class. This strayed away from the Classical static coin profiles and religious imagery that was common prior. The three-quarter view was invented. This new perspective of portraiture made the sitter more identifiable. It was a shift from a focus on religion to that of the individual. Not only was it an individual of a lower class, but he/she was also the sole subject matter of the portrait. This change reflected Panofsky’s insight that this new style of portraiture “seeks to bring out whatever the sitter has in common with the rest of the humanity.” With this said, how would you describe your opinion on the socioeconomic statuses in your choice of sitters? SS: My sitters, I would say, are middle class like myself. It’s not intentional choices to include or exclude sitters from any socioeconomic group. They are students, classmates, and artists from my community. Sometimes my portraits create a dialogue with art history. I may choose a person who resembles a person in a painting from my artistic family: Rogier van der Weyden, Hans Memling, Edouard Manet, Alberto Giacommetti, and Alice Neel. Sometimes my portrait subject is influenced by a social issue. 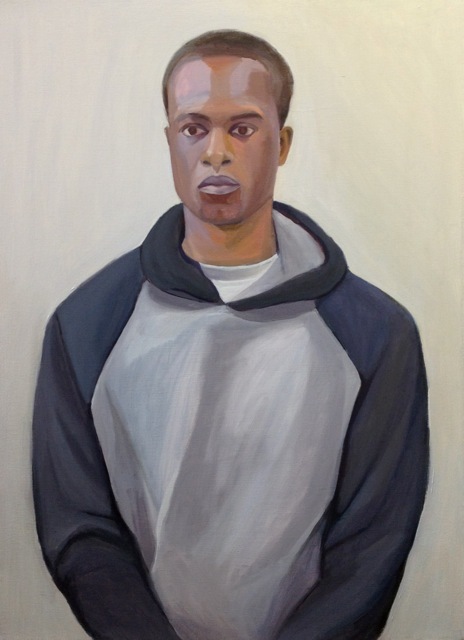 For example, I was thinking about Trayvon Martin, so I asked a classmate to pose for Portrait of a Young Man in a Chaperon. My portraits are natural, yet stylized. They are stripped down, almost minimal. My choice of editing is just as important as painting what is important. I don’t like to paint unnecessary objects. Sheri Schwartz, Karin, 2012, oil on canvas, 24 x 18 inches. JBK: Your work, like Flemish masters, has your sitters up against solid backgrounds that push the subject to the foreground, as if the sitter inhabited the same common space as the viewer. This spatial relationship turns a 2D work into a somewhat of an interactive three-dimensional experience that hovers around optical illusion and the experimentation of entering the private spaces of others. This can create uneasiness, an awkward situation and some tension. How do you handle this effect and what outcomes are you searching for? SS: Most likely, I am thinking about the artist’s gaze; what the viewer would see if they were behind my easel, across from the sitter. I’m keenly aware of the figure ground relationship in paintings. I adjust spatial depth and change focus on parts of the painting which may create tension. Some marks are conscious decisions, and others are subconscious. There’s pressure and tension painting people from life. If this uneasiness contributes to giving a reality to the painting, then that is what I am after. Sheri Schwartz, Modern Maria, 2012, oil on canvas, 22 x 16 inches. JBK: You seek to portray the real presence of your sitters. You’ve worked from photographs in the past and have found it unlike that of painting from life. Painting from life has allowed you to project your interpretation as you paint in real time. 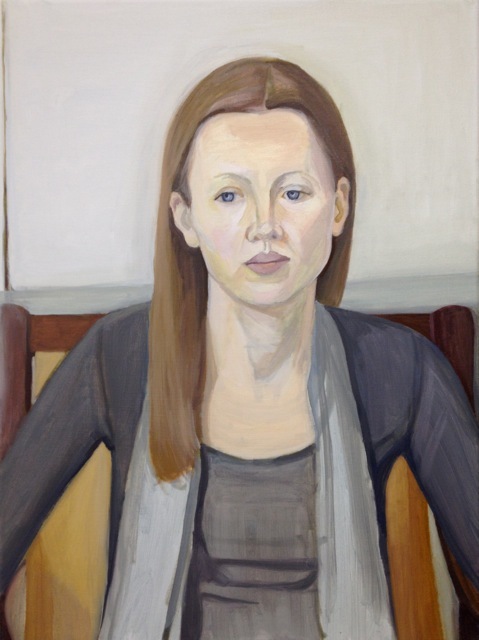 As much as you are seeking to establish your sitters’ expressions, I feel as though your final painting is a culmination of a dialogue between the artist and the muse. Your mannerisms, your conversations and instructions to the sitter will initiate a reaction from your sitter. In the end, the painting is an archive of that foreign, but yet intimate moment shared between you two. What’s your take on making public this moment through your finished work? SS: I start with an idea when I’m painting, though I may change direction. Sometimes it goes full circle. For example, I hardly knew the model in Transparent Portrait. Her body language in the composition, with her hands crossed, may say that I didn’t know her. After a month of her sitting for me, I really got to know her, and the intimacy of our connection prevails in her facial expression. Her transparency and my openness really come across in the finished painting. We not only exchanged personal conversations, but she would encourage me while painting, giving me confidence while sitting for me. Art doesn’t come easy, and my sitters see me struggle. I can’t predict exactly the outcome of any of my paintings; otherwise, I would be an illustrator. I learn the most in my painting while painting under pressure in a vulnerable state. All sorts of influences come out in my paintings. My portraits are really a collaboration; an exchange between artist and model. Sheri Schwartz, Inside Out, 2012, oil on canvas, 20 x 19 inches. JBK: What’s next for Sheri Schwartz? Tell us about upcoming exhibitions and other creative endeavors! SS: My MFA Thesis show opens April 4 at Western Connecticut State University in Danbury, CT. The show then travels to Blue Mountain Gallery in NY, opening June 20. I have a solo show slated for October at the Gilbert Gallery, Miss Porter’s School, Farmington, CT.
Sheri Schwartz, Profile Study, 2012, oil on maple board, 20 x 16 inches. Image at top: Sheri Schwartz, Transparent Portrait, 2012, oil on linen, 20 x 28 inches. Intelligent, minimal and somberly beautiful portraits. Sheri it has been so terrific to see your new works. I especially love Profile Study, 2012, oil on maple board, 20 x 16 inches.